I first read this book in 2016. The advice that resonates particularly with me is on systems vs goals, and the importance of optimising for personal energy. When I ran the London Marathon in 2010 and 2011 I trained for more than 16 weeks and was much fitter by the end of it. As an ex-rugby scrum player, long distance running isn’t my thing but I could have maintained the fitness with some other regular exercise. I’m enjoying pilates now, and it’s easier on my back. Staying physically and mentally healthy comes from sustaining good habits. Here are some suggestions. And you need to exercise self care, looking after yourself so that you can do your best work and help others. In our messy flawed lives the nearest we can get to truth is consistency. Consistency is the bedrock of the scientific method. Some people have no smart friends to help them in their quest for success and happiness. Loneliness damages the body in much the same way as ageing. Loneliness isn’t fixed by listening to other people talk … only by doing the talking yourself and most importantly being heard. Timing is often the biggest component of success. Since timing is hard to get right unless you are psychic it makes sense to try different things until you get the timing right by luck. Goal-oriented people exist in a state of nearly continuous failure that they hope will be temporary. That feeling wears on you. In time it becomes heavy and uncomfortable. If you achieve your goal you celebrate and feel terrific until you realise you just lost the thing that gave you purpose and direction. Your options are to feel empty and useless, perhaps enjoying the spoils of your success until they bore you, or set new goals and re-enter the cycle of permanent pre-success failure. Thinking of goals and systems as very different concepts has power. Goal-oriented people exist in a state of continuous pre-success failure at best, and permanent failure at worst if things never work out. Systems people succeed every time they apply their systems in the sense that they did what they intended to do. The goals people are fighting the feeling of discouragement at each turn. The systems people are feeling good every time they apply their system. That’s a big difference in terms of maintaining your personal energy in the right direction. Losing twenty pounds is a goal, but eating right is a system. Running a marathon in under four hours is a goal, but exercising daily is a system. Making a million dollars is a goal but being a serial entrepreneur is a system. A goal is a specific objective that you either achieve or don’t some time in the future. A system is something you do on a regular basis that increases your odds of happiness in the long run. If you do something every day it’s a system. If you’re waiting to achieve it someday in the future, it’s a goal. 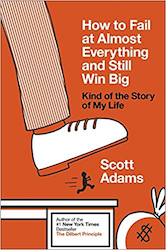 Scott Adams’ plan was to create something that had value and was easy to reproduce in unlimited quantities. He didn’t want to sell his time, at least not directly, because that model has an upward limit. One of the best pieces of advice Scott has ever heard goes something like: If you want success, figure out the price then pay it. Few wishful people have decided to have any of the things they wish for … once you decide, you take action. Wishing starts in the mind and generally stays there. Your best option is to be selfish because being stupid or a burden on society won’t help anyone. Society hopes you wil handle your selfishness with some grace and compassion. If you do selfishness right, you automatically become a net benefit to society. Successful people generally don’t burden the world. Corporate raiders, overpaid CEOs and tyrannical dictators are the exception. Selfish successful people don’t cause worry and stress for those who care about them. As a selfish successful person you can be a role model for others. The most important form of selfishness involves spending time on your fitness, eating right, pursuing your career and still spending quality time with your family and friends. If you neglect your health or your career you slip into the second category – stupid – which is a short slide to becoming a burden on society. We’re raised to believe that giving of ourselves is noble and good. All our lives we are told it’s better to give than to receive. We’re programmed for unselfish behaviour by society, our parents, and even our genes to some extent. The problem is that our obsession with generousity causes people to think in the short term. We skip exercise to spend an extra hour helping at home. We buy fast food to help a co-worker with a problem. At every turn we cheat our own future to appear generous today. Scott is giving us permission to take care of ourselves first. Generous people take care of their own needs first. In fact, doing so is a moral necessity. The world needs us at our best. The healthiest way to look at selfishness is that it’s a necessary strategy when you’re struggling. In hard times, or even pre-success times, society and at least one customer want you to take care of yourself first. If you pursue your selfish objectives, and you do it well, someday your focus will be outward. It’s an extraordinary feeling. [Scott hopes] you can experience it. How do you organise your limited supply of time to get the best result? The way Scott approaches the problem of multiple priorities is by focusing on just one main metric: his energy. He makes choices that maximise his personal energy because that makes it easier to manage all of the other priorities. Maximising personal energy means eating right, exercising, avoiding unnecessary stress, getting enough sleep and all of the obvious steps. But it also means having something in [his] life that makes [him] excited to wake up. When we get our own personal energy right the quality of our work is better and we can complete it faster. That keeps his career on track. And when all of that is working, and we feel relaxed and energetic, our personal lives are better too. When a sad person enters a room the mood in the room drops. And when you talk to a cheerful person who is full of energy you automatically feel a boost. … by becoming a person with good energy you lift the people around you. That positive change will improve your social life, your love life, your family life, and your career. Scott had a number of awful corporate jobs. But he still enjoyed going to work, partly because he exercised most evenings, and usually woke up feeling good, and partly because he always had one or two side projects going on that had the potential to set him free. Do things that maximise your personal energy.